The wait is finally over. 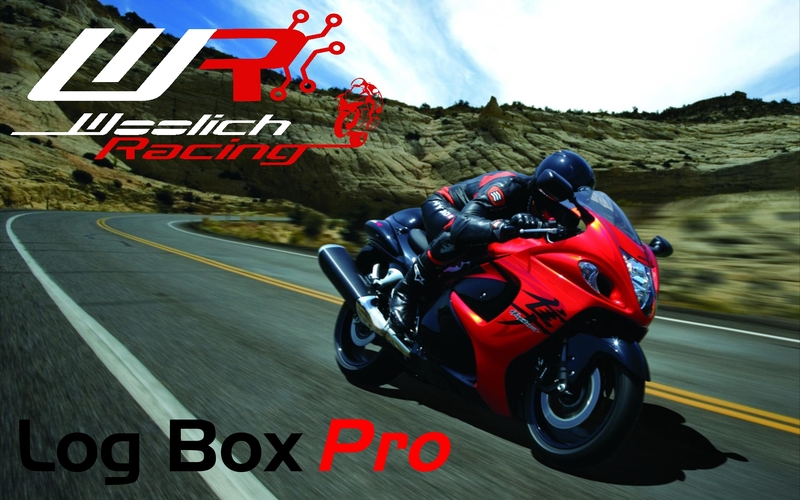 Woolich Racing are proud to announce the release of the Log Box Pro (Denso) LBPD, our premium product for tuning Suzuki and Kawasaki Motorcycles equipped with a Denso ECU. This includes the Suzuki Hayabusa, GSX-R 1000, GSX-R 750, GSX-R 600, B-King, GSR 600, GSR 750 as well as Kawasaki ZX6R. 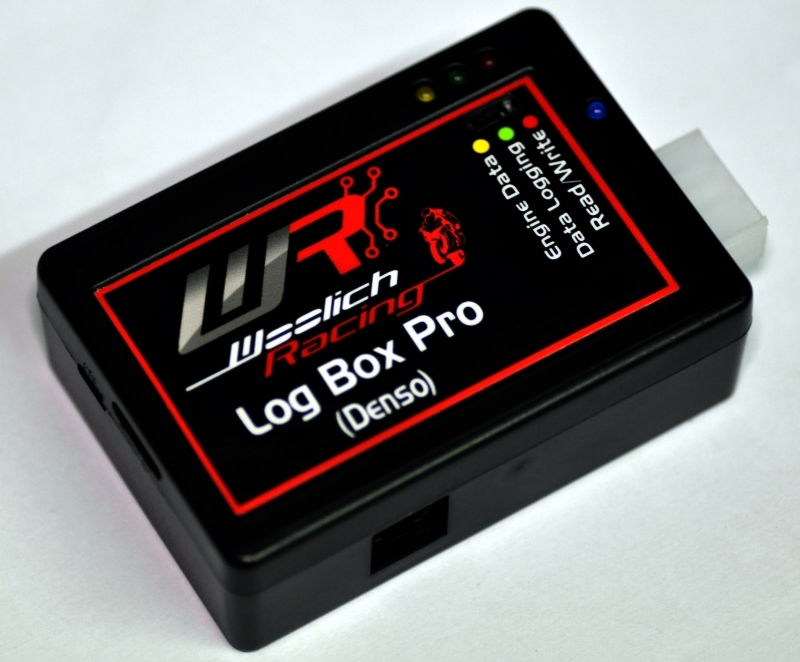 The Log Box Pro (Denso) LBPD allows you to Flash the ECU, view real time Engine Data in the Woolich Racing Tuned (WRT) software, as well as log Engine Data to the on board micro SD card at a blazing fast 100 Hz *. The logged engine data can then be used with the WRT AutoTune allowing you to tune your fuel maps. This allows you to tune your bike using data collected in real riding conditions with factors like Ram Air and other bike dynamics automatically accounted for resulting in an optimal tuning experience. It also allows you to fine tune your bikes performance for different conditions and setups e.g. fuel, altitude, temperature and atmospheric pressure. In addition to the core functionality, we have packed in some cool features that really sets the Log Box Pro apart. There is a fast direct digital connection for Zeitronix Wideband O2 controllers providing a fast and accurate source of Wideband O2 AFR data. There are also 8 high speed high resolution (12 bit) 0-5v AD convertors allowing you to log an additional 8 channels of data from 0-5v sensors on your bike including 0-5v output from different Wideband O2 Controllers. We have also built in a Bluetooth module allowing you to connect to the Log Box Pro via Bluetooth from your computer (and in the future from your smartphone or tablet). ** 2002-2007 Suzuki Hayabusa motorcycles require a new Suzuki Harness Type 1b to work with the Log Box Pro (Denso). The 2002-2007 Hayabusa also does not have a SDS engine data connector, the 8 AD channels should be utilized for logging data with this model. 2006-2009 Suzuki M109R - Log Box Pro + Zeitronix ZT-3 Wideband O2 Package This package includes everything you need to start tuning your 2006-2009 Suzuki M109R with our Log Box Pro and Zeitronix ZT-3 Wideband O2 Sensor. 2006-2008 Suzuki M109R - Log Box Pro + Zeitronix ZT-3 Wideband O2 Package This package includes everything you need to start tuning your 2009-2010 Suzuki M109R with our Log Box Pro and Zeitronix ZT-3 Wideband O2 Sensor. The User Guide for the Log Box Pro (Denso) can be found on our User Guides and Installation Instructions page.